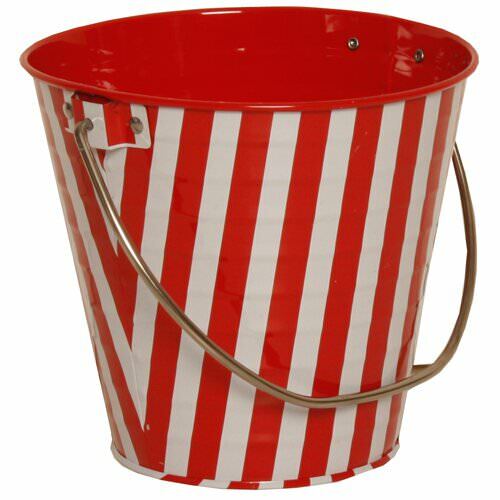 With great storage comes great style, especially with these striped metal pails! Giving your office space (whether at work or at home) a little pizzazz never hurt anyone, and these pails will certainly spice any kind of environment up. Great for organization, decoration, or planting flowers and herbs, these versatile pails will get it all done, all the while looking great. The strong aluminum material will certainly protect all of your items inside, from markers to papers to seeds. Along with the metal handle that makes moving those items easy and efficient! Not to mention the bright colors these metal pails come in that makes your storage style something to praise. These pails are a great alternative to the regular, standard boxes we all have lying around. Mix it up and dig in! Striped Metal Pails base diameter measures 3 3/4. Top opening diameter measures 6 inches. Bucket is 5 1/4 inches tall. Available in Pink Stripe and Pink White Zebra.